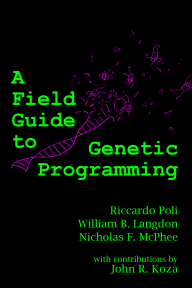 A Field Guide to Genetic Programming: A huge thanks to all our proofreaders! It takes a village to raise a book, and we were extremely fortunate to have an enthusiastic and talented pool of proofreaders. They went through the Field Guide, helping us finding the inevitable typos, and pointing out places where our presentation didn't sparkle quite as much as we thought it did. We spent almost all of the last week before we wrapped the book simply processing their many comments. While I'm sure we didn't address every one of their suggestions, there were hundreds of changes made based on that feedback, and there's no question that the book is better for their hard work and generous efforts. We had the invaluable assistance of many people, and we are very grateful for their individual and collective efforts, often on very short timelines. Rick Riolo, Matthew Walker, Christian Gagne, Bob McKay, Giovanni Pazienza, and Lee Spector all provided useful suggestions based on an early technical report version. Yossi Borenstein, Caterina Cinel, Ellery Crane, Cecilia Di Chio, Stephen Dignum, Edgar Galván-López, Keisha Harriott, David Hunter, Lonny Johnson, Ahmed Kattan, Robert Keller, Andy Korth, Yevgeniya Kovalchuk, Simon Lucas, Wayne Manselle, Alberto Moraglio, Oliver Oechsle, Francisco Sepulveda, Elias Tawil, Edward Tsang, William Tozier and Christian Wagner all contributed to the final proofreading festival. Their sharp eyes and hard work did much to make the book better; any remaining errors or omissions are obviously the sole responsibility of the authors. Thanks again to everyone who helped us get the book out the door!